An epistolary novel, The Gum Thief is written as a collection of journal entries, notes, and letters written by various characters. Among these are regular installments of the characters in Roger’s novella, titled Glove Pond. 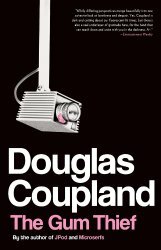 Generation X author Douglas Coupland is to adapt his own novel The Gum Thief as a feature film after striking a deal with J.B Sugar’s No Equal Entertainment.